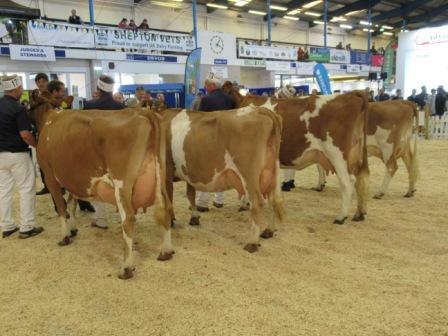 What a splendid display of quality cattle at this year’s National Guernsey Show. Thirty one animals from 12 Exhibitors were present for judge David Mann to inspect. Highlight of the day was an incredible Heifer In Milk class with 9 entries. 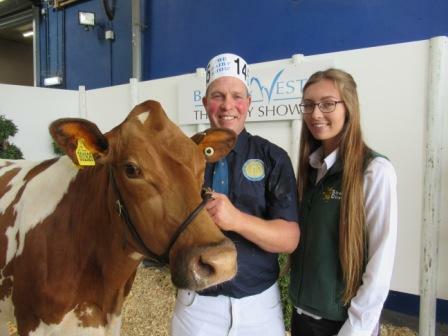 It was a wonderful day for the Warren Family from Penzance on their return to the Dairy show after an absence due to movement restrictions. Their fourth calf cow, Tredinney Conquerors Excellence 11, was awarded Guernsey Champion, repeating her success from two years ago. 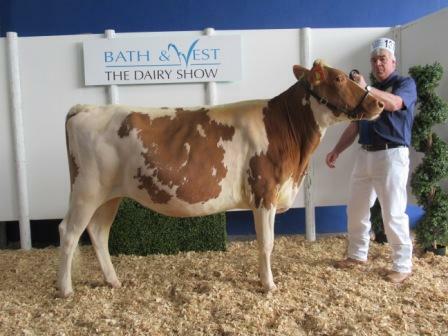 In Reserve stood Junior cow, Highway Legacy Brownie from Matt Blanche and Georgie Sweet. 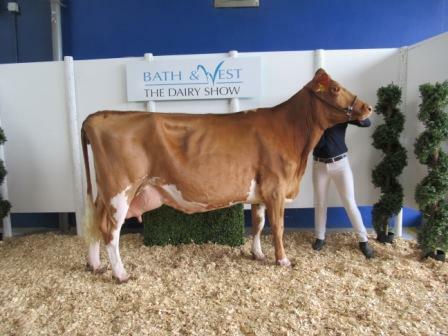 Hon Mention went to Heifer In Calf, Avalon Fernando Indus owned by Kim, Neil and Laura Sales. 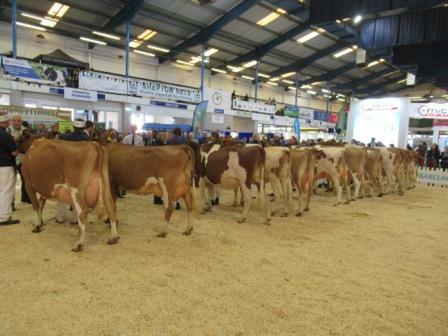 It was a great honour to judge The National Guernsey Show and congratulations must go to all the exhibitors for turning out such quality animals. The first class of the day had three animals forward. 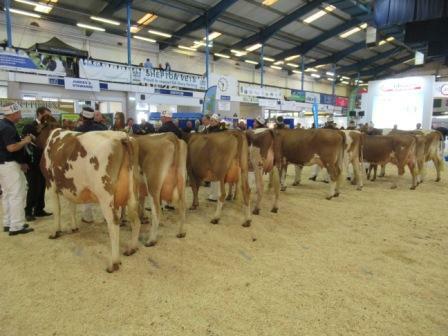 I led away the class with the youngest Heifer who was dairy, had an excellent top line and a promising mammary. The second Heifer was a strong heifer who paraded herself better than my third heifer who was very correct and will develop into a very nice cow. Heifer born between 1.1.17 and 31.3.17. M Dawes. Edgehill Latimer Meadowsweet. C Huins. Vanda Lilian, by Hercules. Hinton Farm. Hinton Dorcas, by H. Sir Galahad. Meadowsweet with Michael Dawes and Sponsor of the class, David Booker from Cornish Mutual. Six entries were forward for my in calf Heifer to calve under 3 years old. The first heifer caught my eye immediately. A very smart heifer with a good top line and rump which gave her the advantage over my second heifer. 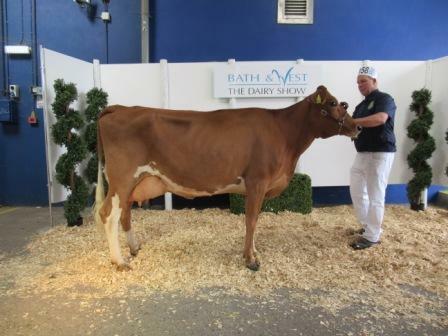 She had good body depth and strength which gave her the advantage over my third heifer, who was one of the youngest in the class but showed real Dairy character. It was the dairyness and sharpness over the shoulder that gave my fourth the advantage over my fifth. My fifth had the advantage in stature and the way she paraded over my youngest heifer in the class in sixth place who I’m sure will develop in time. N.K & L Sales. Avalon Fernando Indus. N.K & L Sales. Avalon Fernando Linda. R. J. & S Warren. Tredinney Rider’s Brenda. R. J. & S Warren. Tredinney Rider’s Hopeful. Hinton Farm. Hinton Samson Gloria. M. Blanch. Highway Legacy Andrew’s Dot2Doris. 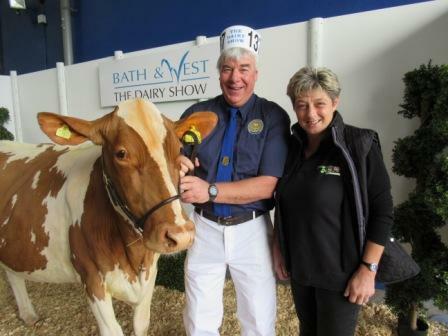 Neil Sales with Nicola Parfitt from Chew Moo’s Ice Cream who sponsored this class. 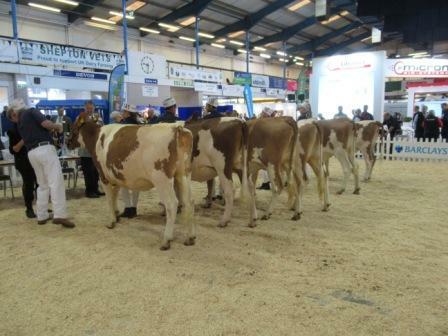 Nine heifers forward in the in milk heifer class. This was a tremendous class and took time to sort out. I led this class with a really stylish heifer who had a really good top line and tremendous height and width to her rear udder. It was is that gave her the advantage over the Heifer in second place who was really balanced with a really deep body. It was this deep body that gave her the advantage over my third heifer . A really balanced heifer who paraded herself well on good legs and feet. It was this that gave her the advantage over the really smart and stylish heifer in fourth. 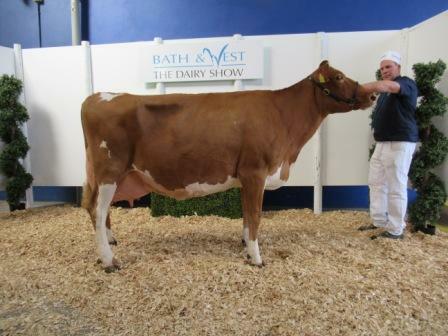 She had a tremendous udder and it was this that gave her the advantage over a big powerful heifer in sixth. This stature and power gave her advantage over a smaller but yet balanced heifer who had a really good udder and teat quality. This gave her the advantage over a similar heifer in eighth. The bloom in this eighth heifers udder gave her the advantage over the stalest heifer in ninth who had been calved 10 months. R. J. & S Warren. Tredinney Harry’s Lilian. R. J & S Warren. Tredinney Garrett’s June Amy 24. Glanmor Jerseys. Glanmor Legend Okapi. I. Crouch. Blacknor Cracker Dynamic Hotlips. Pollard & Coryn. Lucky Cow Princess Annabelle, by Prince. M & C Moody. Latifa Andante Mary 2. M. Dawes. Bourton Clover, by Alstar VIP. M. Blanch. Highway Legacy Pingu, by B. B. Henry. Hinton Farm. Hinton Clarity 47, by Jupiter. 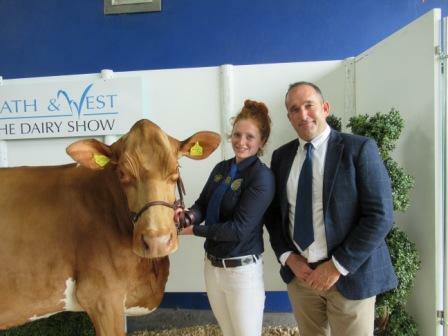 James Warren with Hannah Smith from Sponsors of this class, UK Service Sires. 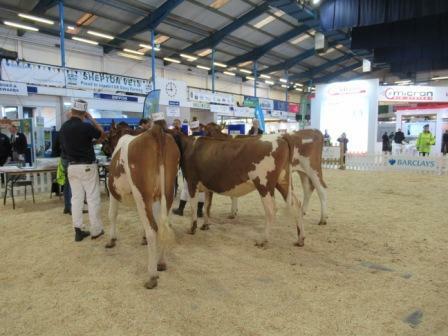 The junior cow class had four animals entered. I led this class with a really smart cow who had the advantage of the height and width of her rear udder and length of fore udder. Two over three had the advantage in stature and spring of rib. My third cow had the advantage over the top line of my milky cow in fourth. R. J & S Warren. Beechgroves Espresso Kylie. Glanmor Jerseys. Brymor Westward 50, by Phonze. M. Blanch. Highway Legacy Aurora, by T. P. Lion King. Hinton Farm. 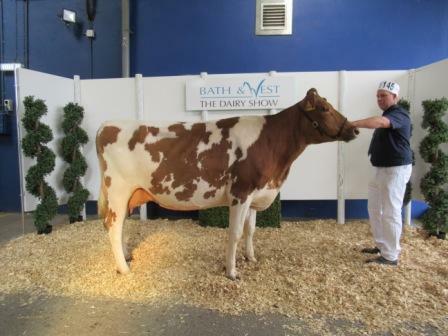 Bockfield Sally 26, by Double L.
The Junior Cow Class was Sponsored by GLW Feeds. 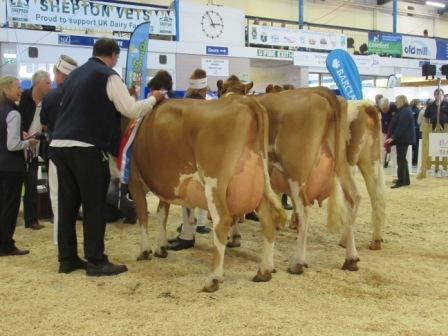 Five cows were entered in the Intermediate class and it was the power, stature and rump structure that gave my class winner the advantage over my dairy and open ribbed cow in second who had a full udder. 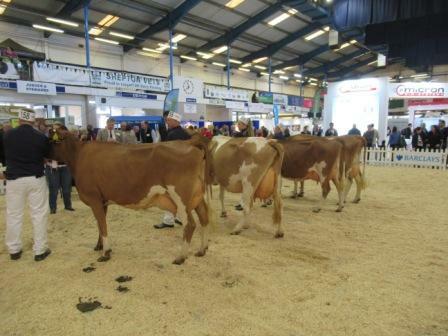 The third cow had good legs and feet and also a full udder gaining her the advantage over a tall dairy cow in fourth. It was this stature that put her above my balanced cow in fifth. M. Blanch. Highway Legacy Brownie, by Andante. R. J & S Warren. Tredinney Ivan Eclipse 26. R. J & S Warren. Tredinney King Posie 15. M & C Moody. Latifa Princess Leia, by Andante. Hinton Farms. Bourton Starlight 11, by Norman. Georgie Sweet with Mark Gully from CMC Ltd who sponsored this class. It was very close between the first two cows in the senior cow class. In the end I led away with the fourth calver in that I felt she had the advantage in being sharper over the shoulder, a better top line and a better fore udder than my tremendous eighth calver. This eighth calver had the advantage in her full udder over my really dairy cow in third. It was this dairyness and stature that gave her the advantage over my fourth cow. R. J & S Warren. Tredinney Conquerors Excellence 11. R. J & S Warren. Blacknor Cracker Banger Boy Lemon 5. Sir Howard Guinness. White Ladies Ruby 94, by Andante. Hinton Farm. Hinton Clarity 41, by H. Cedar. 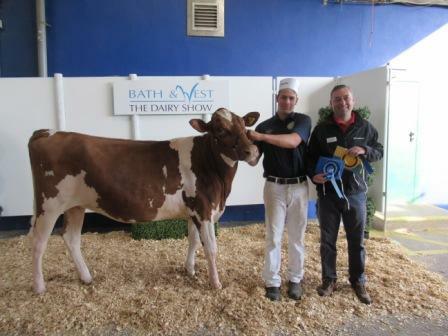 This class was kindly sponsored by Briddlesford Farm Dairy. 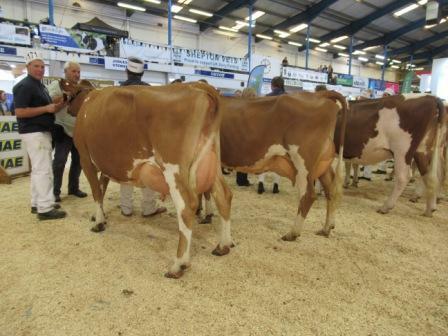 In the Pairs class, I chose my two senior cows as first as they both have tremendous udders and are similar in stature. In second I placed the two in calf heifers as they are both also very similar in that they are dairy and have good legs and feet with a good top line. R. J & S Warren. N. K. & L Sales. The Pairs Class was sponsored by QMP. 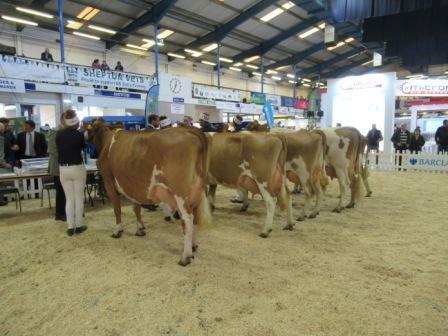 In the Champioship line up, I chose the senior cow as my champion as I think she is an excellent example of the Breed. My Reserve was the Intermediate cow who I particularly love the frame of and my Hon Mention went to the in calf heifer who I think has a bright future. Champion Guernsey, Tredinney Conquerors Excellence 11. Reserve Champion, Highway Legacy Brownie. Hon Mention, Avalon Fernando Indus. 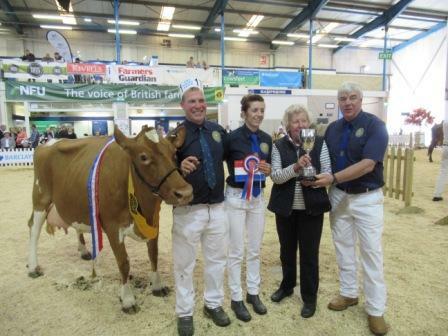 The Peter Down Trophy for the most Points was awarded to the Warren Family with the Sales Family in Reserve. Neil Sales presenting the cup on behalf of the Down Family, to Rosemary James and Shelley Warren. 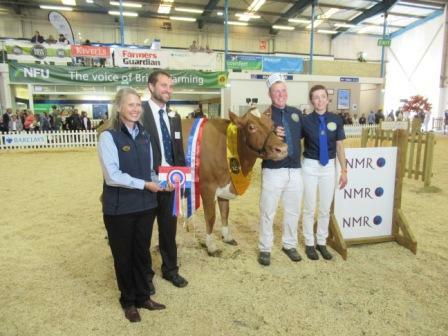 Sponsors of the Dairy Show Guernsey Classes were NMR . Their representative is seen here with Judge David Mann and James and Shelley Warren. The Championship Class was sponsored by EGCS.